The Odia Wikimedia community, a volunteer community that contributes to Odia Wikipedia (https://or.wikipedia.org) and its sister projects, in collaboration with the Centre for Internet and Society (CIS), a Bengaluru based non-profit that works in domains like IP reforms, Accessibility, Access to Knowledge (CIS-A2K), etc. 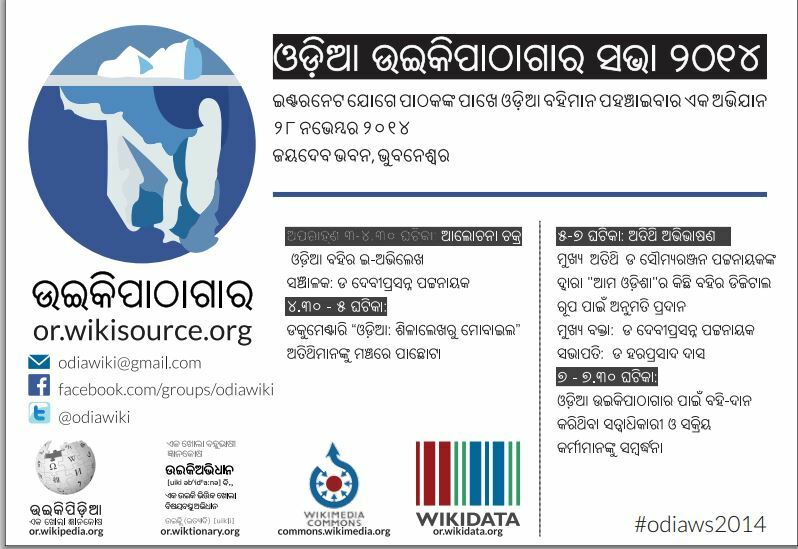 are celebrating the launch of Odia Wikisource on the 28th of November 2014 at Jayadev Bhawan, Bhubaneswar during 3:00 – 7 pm. Odia Wikisource, a sister project of Odia Wikipedia, is a free online library that houses Odia language books online and is available for free at https://or.wikisource.org. It is not just an online library but it focuses on bringing rare and old books that are out of copyright. CIS-A2K has been instrumental to also encourage many notable authors of Odisha to change their license terms to Creative Commons Share-Alike (CC-by-SA) license, a license that allows public access and ability to reuse the content to expand the knowledge base in Odia language on the Internet. We are honoured to invite you to join us to take part in the discussion on “Setting a roadmap for Odia book digitization” during 3-5 pm, screening of documentary “Odia: Silalekharu Mobile”, the public meeting and award ceremony thereafter.